The human machine from Team Starboard lived up to his reputation as the world’s strongest distance racer by claiming Saturday’s 14km race, however Titou showed he’ll once again be a favourite in every event he enters after an impressive and somewhat unlucky performance. Trevor Tunnington (Starboard) had a strong final leg to move up into 3rd, while Lincoln Dews (JM) and Kelly Margetts (Sunova) both paddled hard to round out the top five. Titou led the distance race early before Boothy reeled him in during the light upwind section of the course here in Noosa. The two were neck-and-neck and surfing the same wave in when Titou was clipped by a random (and not particularly clever) free surfer, which sent the Frenchman tumbling and caused him to lose irreversible ground. It may not have changed the result but it certainly robbed the crowd of a potentially exciting finish. The world number four was clearly fired up from the incident, with Titou racing off the line like a rocket in today’s beach race (wait til you see the drone footage). With the overall Noosa event title based on combined results from Saturday and Sunday, Titou either had to finish two spots ahead of Boothy or beat him by more than 50 seconds, both of which looked possible on the first of the five laps. 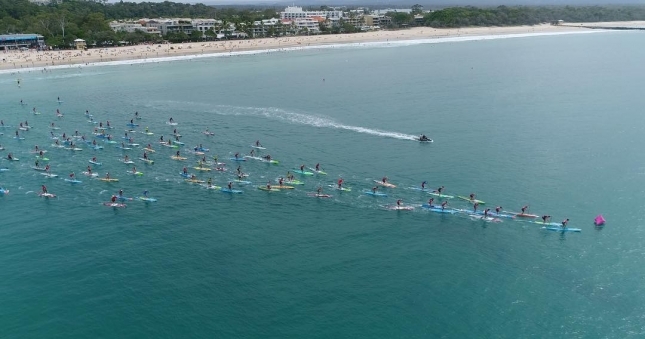 Lincoln kept pace with Titou early and the duo eventually paddled and surfed their way clear to setup a two-horse race around the remainder of the short, sharp 5km “BOP-style” course in front of a big crowd on Noosa’s iconic Main Beach. Boothy had a shocking start and was forced to paddle his way through the field back up to third, however he would go no higher as Titou and Linc controlled both the pace and the waves. Small but fun little waves offered paddlers a respite (and gave the crowd some entertainment as the peleton made Noosa look like a mini version of Salt Creek), while the waves also helped separate the field as some paddlers cruised all the way in from out the back while others lucked out and had to paddle to the beach. 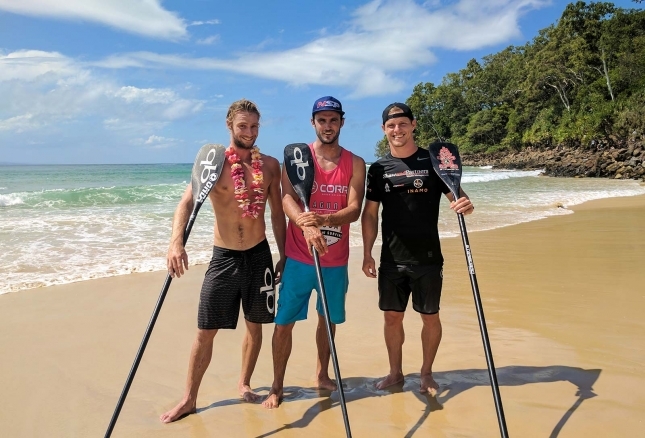 With some of the amateur race paddlers getting lapped and providing a human obstacle course for the front-runners, it looked like it might be a photo finish sprint up the sand as Titou and Lincoln remained side by side. However Lincoln managed to sneak onto a small little bump of a wave in the closing stages that landed him on the shore a few seconds ahead of Titou. Linc sprinted across the line to claim a well-deserved victory for himself and Jamie Mitchell’s Team JM Paddleboards; I didn’t even predict Linc to finish top five overall, however his impressive performance today saw finish top three just a point behind Titou and Boothy. After a couple of light years on the race circuit, Lincoln could be a real name to watch this season particularly in the surf races where he clearly excels. Trev and Kelly once again finished top five to cement the same positions on the overall event leaderboard, while Titou’s NSP teammate Marcus Hansen recovered from a shocker of a finish yesterday (and a terrible start today) to finish top six in the beach race and sneak into the same position overall. Just like in the men’s showdown, the battle for the overall women’s title here at Noosa came down to a tie-breaker, with Kate Baker and Karla Gilbert sharing 1-2 finishes. Kate drew first blood for Team ONE on Saturday, upsetting the defending champ with a very impressive performance in the 14km race that saw her cross the line almost two minutes clear of her rival from Team Naish, while Sondra Purser rounded out the podium. Despite racing at the same time as the guys and therefore having to paddle in the middle of a crowded field, Karla reversed the result in today’s beach race, winding the clock back with a “vintage” performance that saw her surf away from the field and cross the line well clear. However the gap of just over one minute wasn’t enough to reduce the deficit, with Kate carrying a near two minute advantage into today’s decider that saw her win the overall title on a countback. It was a fun weekend with excellent conditions and a big festival setup on the beach that ensured a great atmosphere. 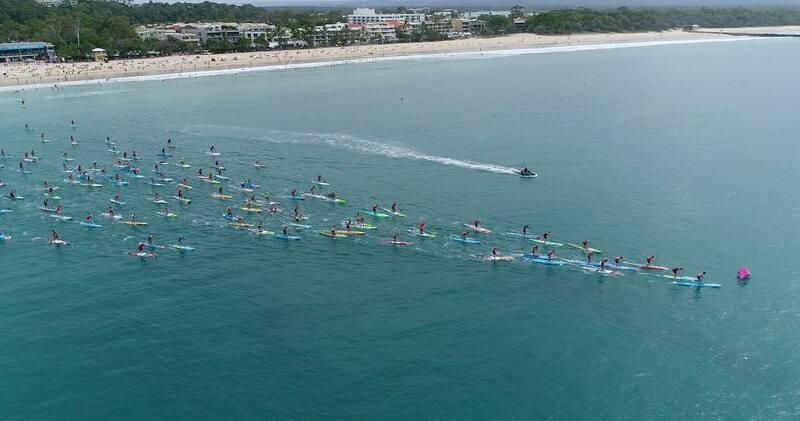 And it certainly wasn’t all about the pros, with over 150 paddlers hitting the water and enjoying the magical backdrop that Noosa provides. 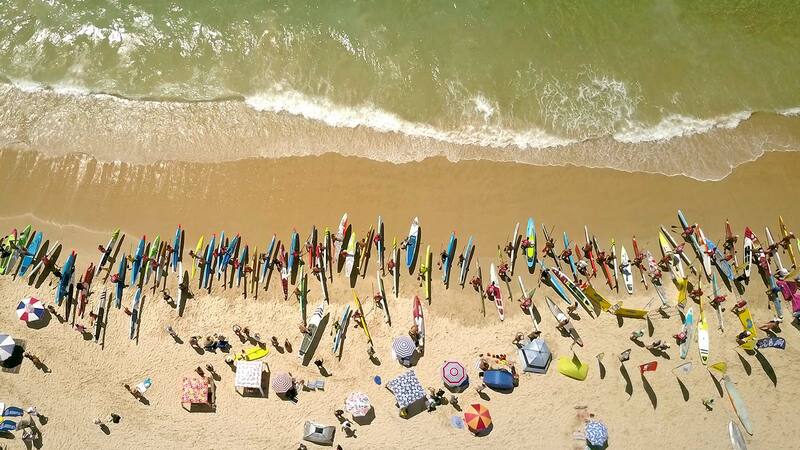 SUP racing was just one part of a seemingly never-ending program here at the week-long Noosa Festival of Surfing. There was also a couple of different SUP surf contests along with a dozen different longboarding events. However the biggest crowd (by far) was reserved for the dog surfing exhibition event on Sunday afternoon, which transformed the beach into a WSL-style amphitheatre. Big thanks to Paul Jones and all the organising crew behind the scenes for putting on the event, and pencil a weekend at Noosa in your calendar for March 2018.